Futaba male kit: 4 x Futaba male connector housings & 12 pins. This "male" connector has the lip on one side; it goes on a Battery pack. Futaba female kit: 4 x Futaba female connector housings & 12 pins. Futaba female kit: 4 x Futaba female connector housings & 12 pins. This "female" connector is what you plug a battery INTO. RC-4xAA : Battery holder for 4 x AA with JR-Futaba-Spektrum-HiTEC connector. Square shape; holds 4 x AA alkaline batteries. Includes connector to plug into JR, SPEkTRUM, Futaba, HiTEC, Airtronics Z.
Futaba charging adapter: Futaba J female connector at one end, and Banana Plugs at the other end. 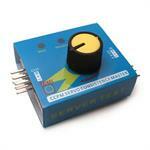 Enables smart-charging of Futaba receiver and transmitter battery packs. 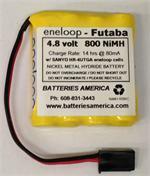 4EP700AAH : 4.8v 700mAH NiMH battery for RC hobby. Choose Shape & Connector. Cells are 2/3AA size. Flat Pack is 2.25" x 1.1" x 0.67"; weight 2 ounces. 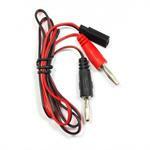 4KR1100AAUW: 4.8 volt 1100mAh NiCd receiver battery. Fits Futaba, JR, SPEkTRUM, HiTEC, Airtronics. Choose Pack Shape, and choose wire leads or Connector type from scroll-down menus. 5VE600AW: 6.0 volt 600mAh Ni-Cd rechargeable receiver battery. Made with 2/3A-size cells (each cell is about 1.1" tall). Choose Pack Shape, and choose wire leads or Connector from menus. Pricing reflects options chosen. 5N700AACW : 6.0 volt 700mAh rechargeable NiCd battery pack, made with SANYO N700AAC cells. Choose shape, and choose w/ wire leads or w/ Connector. Pricing varies with options chosen. 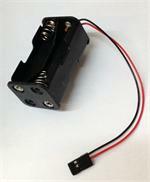 2S1800Rx: 7.4 volt 1800mAh rechargeable Li-PO battery for RC. These battery packs are MADE IN USA. Dimensions: 2.5" x 1.35" x 0.65". Choose Futaba or SPEkTRUM-JR-HiTEC connector. Includes balance charge connector. 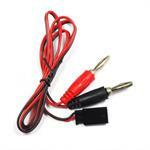 5EP700AAH : 6.0v 700mAh NiMH battery for RC hobby. Choose Shape & Connector. Cells are 2/3AA size. Flat Pack is 2.9" x 1.1" x 0.67"; weight 2 ounces. 4HRAAUW : 4.8 volt 1650mAh Ni-MH Receiver battery. Choose Shape and Connector. 4HRAAUW: 4.8 volt 1650mAh Ni-MH LONG LIFE RC receiver battery. Made with HR-AAU 1650mAh Ni-MH AA-size cells. Same dimensions as standard Rx packs, but provides much more operating time. Choose shape, and choose wires or Connector. 4.8 volt 1300mAh Ni-Cd receiver battery. Made with 4 x N-1300SCR "Sub-C" size cells. Can be Slow-charged or Fast-charged. Choose Pack Shape, and choose wire leads or Connector from scroll-down menus. 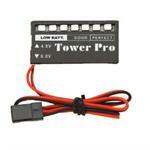 2S2200RJ: 7.4 volt 2200mAh Li-PO battery for RC receiver & transmitter. Size: 3.25" x 1.2 x 0.5". Lightweight, compact, high capacity. Choose Futaba or SPEkTRUM-JR connector. Includes red JST (for Walkera Tx) and balance connectors. 4EP300AA : 4.8volt 300mAh rechargeable NiMH battery packs for RC. Small, compact 1/3AA cell size. Choose shape & Connector. 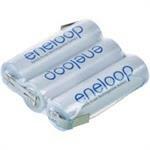 3.6 volt 2000mAh SANYO eneloop AA high-capacity battery packs. PRE-CHARGED & READY TO USE. Made with eneloop 2000mAh AA-size cells. Choose shape, Connector, Wire Leads, etc. Sale pricing (no Conn.) starts at $20.00 ea. 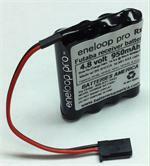 4EN950AAAW : 4.8 volt 950mAh ENELOOP AAA NiMH receiver battery pack. Arrives to you PRE-CHARGED & READY TO USE ! Choose connector & shape. These eneloop cells retain their charge for over a year when not in use !